Possibly no other theme has generated as much debate as the kingdom of God. What is it? When will it arrive? Has it already? In what way? Who are its recipients? And the list goes on. This issue of Tabletalk, however, will not be entertaining such question in any great detail, for it is our desire to share with our readers some of the sweeping themes found in Scripture regarding God’s kingdom — elements upon which all Christians can and should agree. 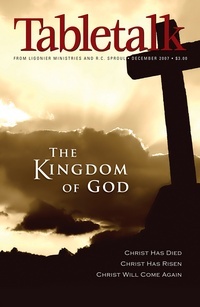 Thus the theme of the December 2007 issue of Tabletalk focuses on the kingdom of God by exploring its revelation in the Word, its inauguration and consummation, and finally its meaning and practice in the life of the church today. Contributors include R.C. Sproul along with Iain Duiguid, Dennis E. Johnson, Keith A. Mathison, Scotty Smith, R.C. Sproul Jr., and Gene Edward Veith. Tabletalk features articles about topics central to the Christian faith and daily, in-depth Bible studies.